Known for its cornfields, basketball and motorsports, Indiana also has a lesser known maritime history. Resting between America’s two great inland waterways, the Ohio-Mississippi river system and the Great Lakes, Indiana has seen all types of vessels ply their trade along its shoreline. For over 200 years, vessels were lost along its shoreline from the same hazards more commonly found on the high seas. Read a sample section below. The wooden packet sidewheeler Governor Morton attempted to bring back commercial navigation to the upper White River in 1865. Built in Indianapolis in 1865 for the Indianapolis and White River Steamboat Company, the Governor Morton was 100 feet long, 21 foot beam, and drew 2 feet 4 inches deep. The sidewheeler boasted it could carry nearly 200 passengers. Her master was Henry M. Socwell from Vevay. Locals called him the “Vice Admiral” for his prior experience on the Ohio and Mississippi rivers before arriving in Indianapolis. Launched on July 1st, the vessel began trial runs up the White River. The Morton made several trips further up the river and was able to reach past the mouth of Fall Creek to Crowder’s Ford on August 25. However, it wasn’t until the next April the Governor Morton reached its further point upstream. The sidewheeler was able to reach a point near Cold Spring because of the high water levels. A few months later, the Morton attempted the same feat, but it quickly grounded. Unlike the spring, water levels were quite low during the summer months. 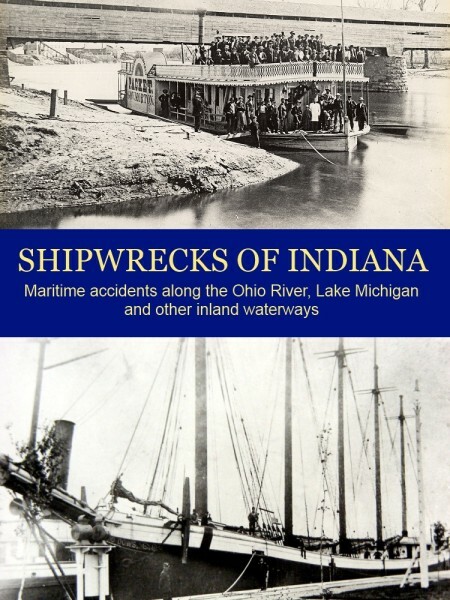 While the vessel was popular among the citizens of Indianapolis, the company had failed. Locals joked that the only profitable trip was one where the Governor Morton became stuck on a bar for several hours with passengers spending 25 cents per drink at the bar on board. The problem was that the upper sections of the White River was just too shallow and full of obstructions. The only way for a packet to operate was to have the many drifts and bars removed. When the state and federal government aid failed to appear, it wasn’t a shock that the Governor Morton was found sunk at its mooring on August 6, 1866. The watchman on board had been asleep when the vessel settled to the river bottom. It was assumed that the owners had scuttled the vessel. The Governor Morton was later raised and was sold for $1,200 who used it as a barge to haul paving boulders. Dunn, Jacob Piatt. Greater Indianapolis; the history, the industry, the institutions, and the people of a city of homes. 1910. You’ll receive an email notification when the paperback and ebook become available.